3. Contain appropriate mineral composition that human body need. 5. Dissolved oxygen >6mg/L, and contain appropriate carbon dioxide. 6. Half width of water molecular cluster is less than 100 Hz. 7. Act as nutritional media by having functions like dissolution capacity, penetration capacity, diffusion capacity, metabolic capacity, emulsifying capacity, and cleaning capacity. So far,it’s only ALKALINE BALANCE WATER that can fully meet the above criteria. ALKALINE BALANCE WATER is not only suitable for long-term consumption by healthy person, but also plays an apparent role on regulating gastrointestinal and blood lipid, as well as anti-oxidant, anti-fatigue and beautifying. Drinking ALKALINE WTER leads to healthy life! Acidic physical conditions are the source of sickness, while most of ordinary drinking water appears to be slightly acid and long-term drinking will accelerate the acidification of the body. 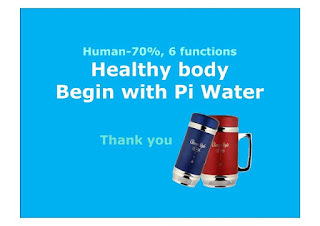 Water that filter by pi cup can control the water pH value in the range of weak alkaline to be beneficial for clearing acidic wastes of the body and improving the body’s acidic environment. With technologies like electrolysis and far-infrared, pi cup activates water quality by changing it into small molecular cluster water. Small molecular cluster water provides strong penetration and good solubility, easily absorbed, improves body microcirculation and promote metabolism. Ordinary drinking water has positive potential that promote oxidation and aging. 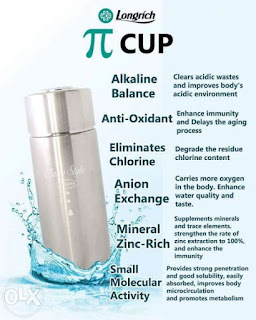 Specific negative potential technology of the pi cup water can deliver more active hydrogen for body and eliminate excess free radicals, help to enhance immunity and delay aging process. 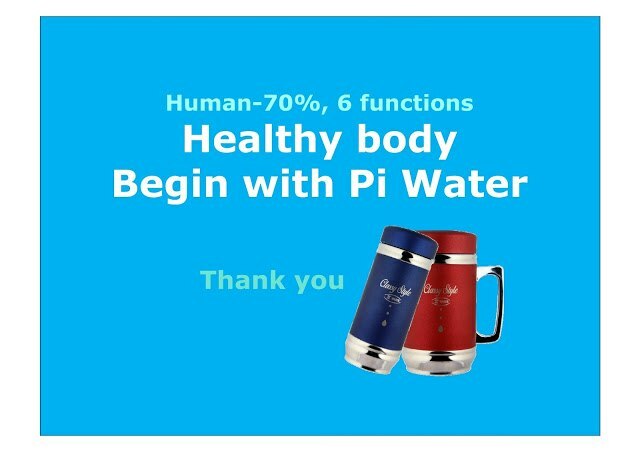 Upon unique combination of the pi cup’s filters, the pi cup water supplements minerals and trace elements according to the most appropriate proportion for human body to make the water suitable for absorption. It also can effectively strengthen the rate of zinc extraction to 100%, and enhance human immunity. Remember we talked about the benefits of anion here. 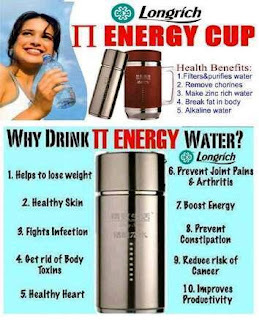 Ordinary drinking water does not carry negative ions, but the pi cup water is rich of negative ions, which can carry more oxygen for body. 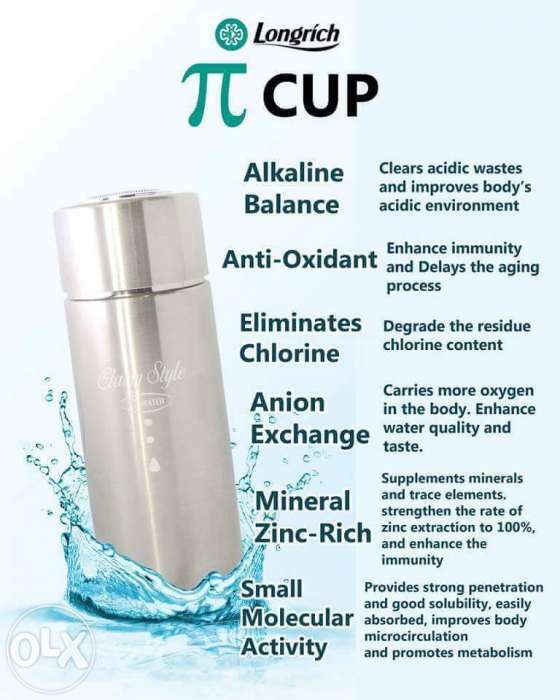 The pi Cup water also helps in activates cells, enhance water quality and taste. Being a strong oxidant, chlorine can undermine oral mucosa. Trichloromethane that produced after boiling belongs to strong carcinogenic substance. 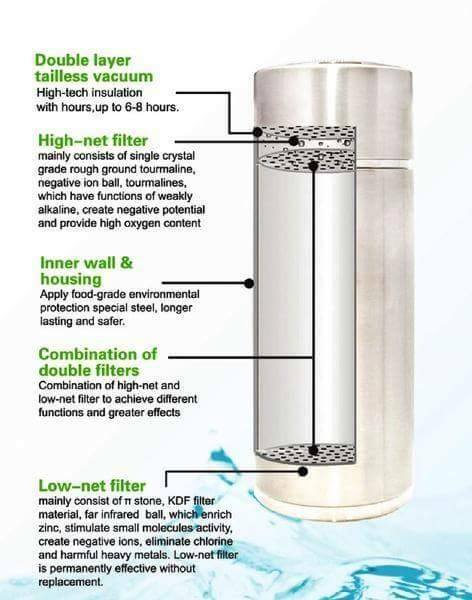 With Pi Cup water, it can effectively degrade the residue chlorine content that dissolved in water and reduce the damage of chlorine toxicity inside our body. 1. It is normal if there is any sound when an empty cup is being shaken as it is designed to acquire better efficacy by enlarging the specific contact area between the energy substance and water. 2. 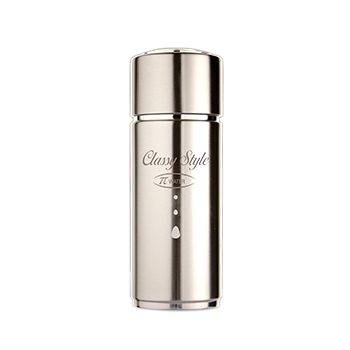 At the first time, rinse and shake the cup repeatedly with 60 C hot water. 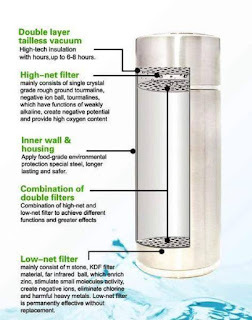 In order to activate the filter, repeat the above action till water poured out become clear. 3. Before drinking, pour in pure or boiled water (below 20 C) for 1-3 ; ensure water level is above the filter element. 1. It is prohibited to swallow the energy filtering material. 2. To maintain the surface activity of the energy molecules and prolong the service life of the cup, do not pour any mushy material, carbonated beverage, milk or coffee into the cup. 3. It is neither allowed to heat the cup in microwave oven or over fire, nor to bring the cup directly close to any fire source. 4. Keep the cup (full hot water contained) away from the reach of child in order to avoid any heat injury. Remember it's all about healthy living.... Start afresh, change your lifestyle..... Health is Wealth.